As a homeowner, would you rather pay $80 per month for heating and cooling costs or $500? Brad McLaughlin, general manager of MCL Construction Ltd. in the Quispamsis area of New Brunswick, Canada, bets that most people would choose to pay $25 if they could. McLaughlin estimates that the three-bedroom, two-bathroom, two-story home would cost about $500 to heat and cool if it were built to minimum housing code standards rather than the Amvic ICF it’s made with. Eighty dollars may even be too high of an estimate, McLaughlin says. The house was designed to be net zero. That means the home will produce as much energy as it would consume in a year. Energy saving assets include the use of triple-glazed windows, a low-flow velocity heat pump system, a heat pump hot-water tank and a battery that charges from the extra electricity and kicks in when there is a power outage. Forty-four solar panels provide what little energy the home does use. Usually, the home is selling power back to the grid. MCL Construction was started in 1978 and McLaughlin is the second generation to operate it. He left the family business and then returned to it six years ago, after his father had started using ICFs for basements and additions. MCL Construction had already been building R-2000 homes, a best-in-class energy rating system developed by Natural Resources Canada. An R-2000 home is 50 percent better in efficiencies than a code home. The Quispamsis house is the province’s first net zero home to be certified by both the federal government and the Canadian Home Builders’ Association. 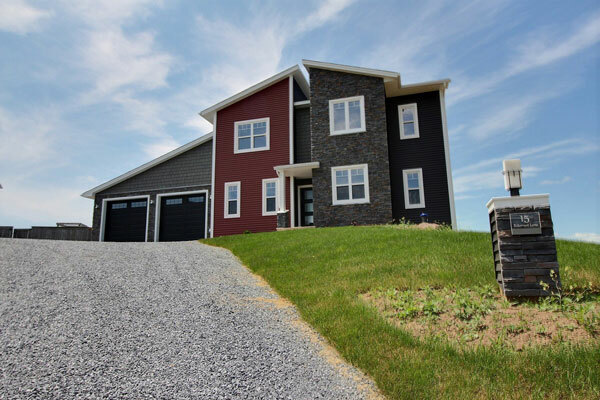 After the Quispamsis home was built, it was on the real estate market with an asking price of $695,750. That may be a higher asking price than other homes in the neighborhood, but if the homeowner pays $25 per month (for a hookup fee they have no choice but to pay) rather than $500, that’s a savings of nearly $6,000 per year over the (long) life of the home. McLaughlin has used other ICF systems but he uses a Canadian system called Amvic because he finds it to be a sturdy block that is also fully reversible. “If you mess up on a cut you can use that block somewhere else,” he says. Four years ago, he built his own family home out of ICFs, “to the rafters,” he says, and decided to build this model home to help educate the community about the benefits. McLaughlin also appreciates that the use of ICF walls covers him in different ways. According to Canadian code, if you build a foundation it must be insulated to roughly R-20. 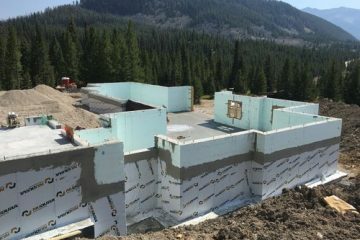 By installing an R-22 ICF block that has no real thermal loss, McLaughlin can build his foundation wall and he doesn’t have to go back later and insulate it. The Quispamsis home is a first step to educating New Brunswick people about the real values of ICF homes. It’s an unfamiliar technology to other builders and potential homebuyers in the area, but seeing how well the home performs is helping. McLaughlin says “code minimal” builders are building to a code established 10 years ago, so that means a new home is already not very efficient for today’s world. But when he has the chance to explain all of the ICF’s benefits, potential homebuyers are into it. Plus, the other less tangible benefits such as ICFs being quiet and strong. All that adds up to make ICF highly desirable at the end of the day. McLaughlin installed a dashboard on the home, so that it is easy to see how much energy is being produced by the home’s solar panels and how much is being consumed. If there’s a bright sunny day and the home is producing a lot of electricity, McLaughlin says, the homeowners might understand that they can do an extra load of laundry that day. But on a low-power day, they might choose to conserve. In years past, a home’s primary energy use was through appliances. Now, it’s the occupants. The heat pump hot water tank is another brilliant energy-conserving choice. The Power Pipes drain water heat recovery unit recovers heat from the warm shower water as it flows down the drain. It works by using outgoing warm drain water to pre-heat incoming cold fresh water so the water heater has less work to do. This reduces the amount of energy used to heat water because this already-warmed water is returned to the hot water tank. McLaughlin believes that homebuyers should invest a little extra more up front to get a home that returns savings over its lifetime. 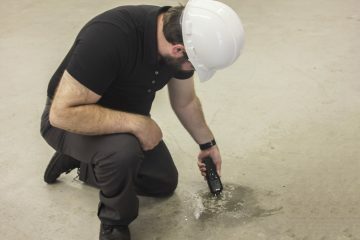 He recommends doing an energy analysis by looking at a code home you want to build and then seeing how the numbers change if you add more insulation on walls or increase the air tightness. This article originally appeared in our November/December 207 issue.